My favorite food smell in the entire world is the scent of freshly popped popcorn, hands down. There's nothing quite like it. Sometimes, I think that I go to the movies more for the popcorn than for the actual movie. In fact, I know I do. I'll avoid some theaters completely because of their stale, from-a-big-plastic-bag popcorn. And I'll go out of my way to frequent some theaters simply because they have superior corn (see: Angelika Film Center, Film Forum, Battery Park). Because of this weird obsession of mine, I've learned how to make my very own homemade popcorn. It took me about two years of popping corn at least once a week to perfect the recipe. That's a lot of popcorn. But I was using the wrong oil the whole time. You see, I started off using extra virgin olive oil. I thought that was pretty good. But then I mixed the olive oil with a few drops of white truffle oil, taking the taste of the final product up a few notches. And then I decided to experiment with safflower oil, which made for a more satisfying pop and a different taste (although not necessarily better). And finally, just last week, I stumbled upon The One; the perfect oil partner to my corn. It's simple, really: good old-fashioned canola oil. 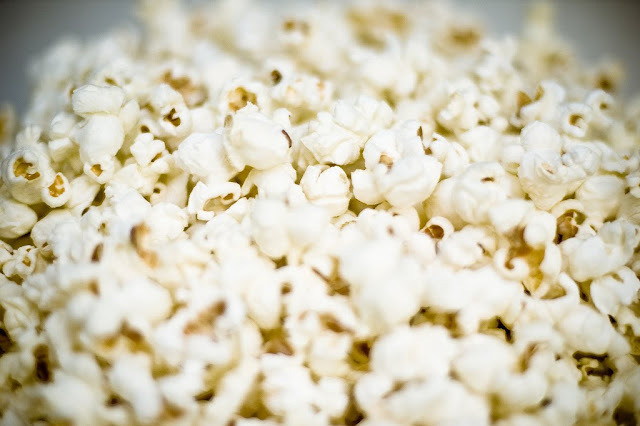 It produces that signature, mouth-watering movie theater popcorn taste that we all crave, and it does it without all the additives, fake salt, and the extra 1600 calories. Heat oil in a large pot on the stove over medium heat. Drop in three kernels of popcorn. When they pop, pour in the rest of the popcorn and cover with a tight-fitting lid. Cook on medium heat until kernels stop popping. Be sure to give the pot a good shake every minute or so to make sure the kernels are popping evenly. In the meantime, melt butter in a separate pan or in the microwave. When popcorn is done popping, remove from heat immediately, pour butter over, and sprinkle with sea salt. Put on a movie, and eat.